At the entrance of the gallery, large relief map of vast territory of South-Western Asia shows routes that linked various regions. Inside the gallery is chronologically placed material from Stone Age, village cultures of Baluchistan and the great Indus Valley Civilization, which flourished more than a millennium from 2500 BC, influencing an area four times that of ancient Sumer. Harappa and Moenjodaro are now known as twin capital of this vast urban civilization. What surprises the modern mind is careful town planning that went into building up Moenjodaro. The carefully laid-out streets, well-aligned houses, the efficient water-supply and drainage system and rectangular blocks pre-suppose the rule of well-established and strong civil authority enforcing strict laws. Charred remains of wheat and other cereals coupled with drawings of certain animals and fish indicate the intake of wholesome diet by people of the region. Mystery still shrouds the seal found in twin capitals and pictographic script still remains to be deciphered to unravel many unknown facts about the ancient inhabitants of Indus Valley. Humped and short-horned bulls, elephants, wild boars, tigers, rhinoceros engraved on the seals tell of their existence in that early civilization, just as clay and faience, models of dogs, ducks, squirrels, doves, parrots and peacocks that have been unearthed. The creativity and aesthetic sense of the people of Indus Valley Civilization are evidenced in their use and design of beautiful jewelry. The original bust of King Priest that is kept in glass case in the Museum testifies to the fact that both men and women wore ornaments made of semi-precious stones, gold, silver and bronze. Household objects, pottery, needles, awls, axes, saws, sickles, knives, locks and fishing hooks are encased in glass window. Generally these objects went into the grave with their owners and custom of burial was conventional practice among the people of Indus Valley Civilization. Diorama near the Eastern side of the gallery depicts Moenjodaro waking to the day's business. One sees double-storied buildings, porters loading cotton on boats ready to set sail on Indus, potter and carter at work and mandarins on the move. Outside the Buddhist gallery, a show-case display objects like terracotta figures, copper utensils, iron implements which furnish yet another proof of their maker's creativity and artistic skill. They were the people who inhabited the vicinity of modern Taxila, remains of ancient Gandhara region in North-west of West Pakistan. In Gandhara Art Buddhist legends dominate. Its subject matter principally relates to the study of Buddha, representing his conception, childhood, marriage, renunciation, enlightenment, preaching and death. The statues of Buddha, found in Taxila, depict various ways of posture and meditation. Before his enlightenment , he was called Boddhisattava. At that stage, he is shown as Raja (king), wearing ostentatious robes and jewelry. As Buddha, he is depicted in simple robes with serene face and a halo. A view of Buddha heads reveals traces of Greek influence, as do some other statues, found in this section of Museum, reminding one of the image of Hercules or some other Greek mythological figures. 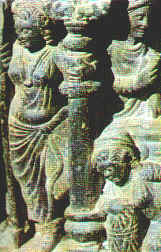 Non-Buddhist deities also occur in Gandhara art. Of these, the popular ones are "Indra", "Brahama" and the thunderbolt carrier "Vajrapani". Toilet trays with embossed or carved legendary romantic scenes of Greek and Roman mythology are also seen on the walls. Among Northern wall are dioramic panels depicting life-story of Buddha, arranged in series. Along Southern side are other specimens of stucco and terracotta figures and representation of Buddhist monastery at Takht-i-Bahi shows the living quarters of Buddhist monks and quadrangle of worship and prayers, while a tall stupa towers over the scene. Covered passage, leads to the next gallery, displays gold ornaments and jewelry. The workmanship on these objects proves the high degree of advancement reached by Gandhara people. Next section displays Hindu sculptural art, which flourished in both East and West Pakistan, from 6th to 11th century AD. With few exceptions, smoothly finished and minutely detailed sculptures are in fine-grained, dark-colored basalt from East Pakistan. Main figures here are those of "Shiva", "Surya", Sun-God and "Vishnu". Sculptures for West Pakistan include two fine examples of brass statues of "Rama" and "Brahma", obtained from Tharparkar in Sind. Marble and wooden carving from Hindu Temples add to the exquisite craftsmanship and beauty found in this section. In Southern wing of the first floor is situated Muslim gallery. There are arms, armors, ceramics, brass and metal wares, scientific instruments and specimens of Buwayhid textiles, woven in contrasting colors of brown, blue or black with buff white. The most important object is Mohammad bin Qasim's siege of Debal in 711 AD. Arab army, equipped with large, wheeled catapults capable of throwing heavy stone missiles across long distances, are shown here. It was this conquest which ushered in 1000 years of Muslim rule in the subcontinent, a sequel of which is the creation of Pakistan. 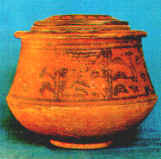 From Bhambore, about 40 miles from Karachi, have been excavated the earliest remain of Islamic culture of Pakistan. A number of copper coins of Umayyad period have been found along with specimens of pottery made in Syria, during that period. Those are unglazed, white, thin-textured and molded in relief with "Kufic" inscription and floral-geometric patterns. Glazed pottery vessels, drug up from the same area, show Persian influence, which became more pronounced in the specimens recovered from upper levels. Glass articles show high quality of craftsmanship and technique, known to have existed in Syria, in early Islamic period. Ceramic ware objects with artistic carving were also popular in Muslim world, so that they gave rise to the "cut glass" school in Iran. All the phases in the development of glass ware by Muslims are represented in the gallery. Metal ware with floral decorations from subcontinent and Central Asia is also on display. Some of the silver inlaid brasses in Seljuk style are among the most beautiful in the world. Art of metal decoration was developed in individual and finer style under the patronage of Mongol in subcontinent. On the second floor of Museum, there is fantastic display of Muslim calligraphy. Angular "Kufic" and cursive "Naskh" are the early forms used during the first century in Islamic architecture, in copies of Koran and in textile and pottery, written in vertical strokes. Miniature painting of portraits of Mongol emperors, queens and princes, who patronized the art, also adorn the gallery. A number of these paintings depict hunting, court and romantic scenes. In these miniatures, Persian delicacy of detail and linear grace blend with the characteristic Indian palette of varied greens, glowing reds and oranges. Numismatics Section of National Museum stored a large number of coins from the earliest punch marked pieces to 19th century. A few enlarged models of gold coins, among these, the one found in Banbhore, bearing the name of Abbasid Caliph, Wasiq Billah, minted in Egypt in 884 AD. Ethnological gallery, on its western side, shows representative collection of the living culture of various tribal, semi-tribal and part of the rural population, living in different regions of Pakistan.